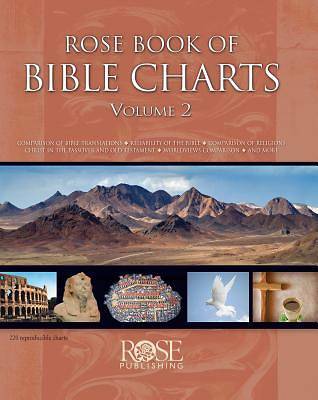 More than 230 pages of reproducible Bible charts in one book Topics include Bible Translations comparison chart Why Trust the Bible? Heroes of the Old Testament Women of the Bible Life of Paul Christ in the Old Testament Christ in the Passover Names of Jesus Beatitudes Lord's Prayer Where to Find Favorite Bible Verses Christianity and Eastern Religions Worldviews Comparison Chart 10 Q & A on Mormonism/Jehovah's Witnesses/Magic/Atheism Pursuing Jesus and many others Buying these charts separately would cost $130. You may reproduce up to 300 copies of any chart free of charge for your own classroom. Full color; contains most Rose material published since 2005. Hardcover with a spine covering a spiral binding. 233 pages.